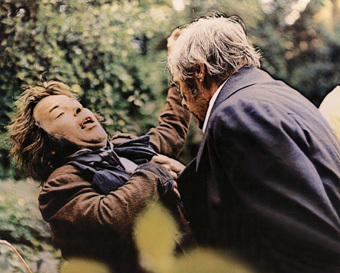 The Enigma of Kaspar Hauser is based upon the true and mysterious story of a young man who suddenly appeared in Nuremberg in 1828, barely able to speak or walk, and bearing a strange note. He later explained that he had been held captive in a dungeon of some sort for his entire life and had only just been released, for reasons unknown. His benefactor attempts to integrate him into society, with intriguing results. Werner Herzog was born in 1942 and has produced, written and directed more than 60 films, published more than a dozen books of prose, and directed as many operas. A selection of his films includes: EVEN DWARFS STARTED SMALL (AUCH ZWERGE HABEN KLEIN ANGEFANGEN, 1970), LAND OF SILENCE AND DARKNESS (LAND DES SCHWEIGENS UND DER DUNKELHEIT, 1971), FATA MORGANA (1971), AGUIRRE: THE WRATH OF GOD (AGUIRRE, DER ZORN GOTTES, 1972), EVERY MAN FOR HIMSELF AND GOD AGAINST ALL (JEDER FUER SICH UND GOTT GEGEN ALLE, 1974), HEART OF GLASS (HERZ AUS GLAS, 1976), LA SOUFRIÈRE (1977), STROSZEK (1977), WOYZECK (1979), NOSFERATU THE VAMPIRE (NOSFERATU: PHANTOM DER NACHT, 1979), FITZCARRALDO (1982), WHERE THE GREEN ANTS DREAM (WO DIE GRUENEN AMEISEN TRAEUMEN, 1984), COBRA VERDE (1988), ECHOES FROM A SOMBRE EMPIRE (ECHOS AUS EINEM DUESTEREN REICH , 1990), SCREAM OF STONE (SCHREI AUS STEIN, 1991), LESSONS OF DARKNESS (LEKTIONEN IN FINSTERNIS, 1992), BELLS FROM THE DEEP (GLOCKEN AUS DER TIEFE, 1993), MY BEST FIEND (MEIN LIEBSTER FEIND - KLAUS KINSKI, 1999), INVINCIBLE (2001), TEN MINUTES OLDER: THE TRUMPET (2002), WHEEL OF TIME (RAD DER ZEIT, 2003), GRIZZLY MAN (2005), THE WILD BLUE YONDER (2005), RESCUE DAWN (2006), ENCOUNTERS AT THE END OF THE WORLD (2007), BAD LIEUTENANT (2009), MY SON, MY SON, WHAT HAVE YE DONE (2009), THE CAVE OF FORGOTTEN DREAMS (DIE HÖHLE DER VERGESSENEN TRÄUME, 2010), and INTO THE ABYSS (2011).